Behold the beginning of our 100 Favorite Dishes of 2016 listicle! Every day through the publication of our Best Of 2016 issue (and sometimes, twice a day), we’ll be bringing you our favorite dishes across Orange County, leading up to the best in the land. Enjoy! Remember when “On The Line” food maven Anne Marie Panoringan featured Chef Gary Mead of Mead’s Green Door Cafe? In that interview, Anne Marie asked Chef Mead what ingredient he considered most undervalued. His bold answer: cauliflower. 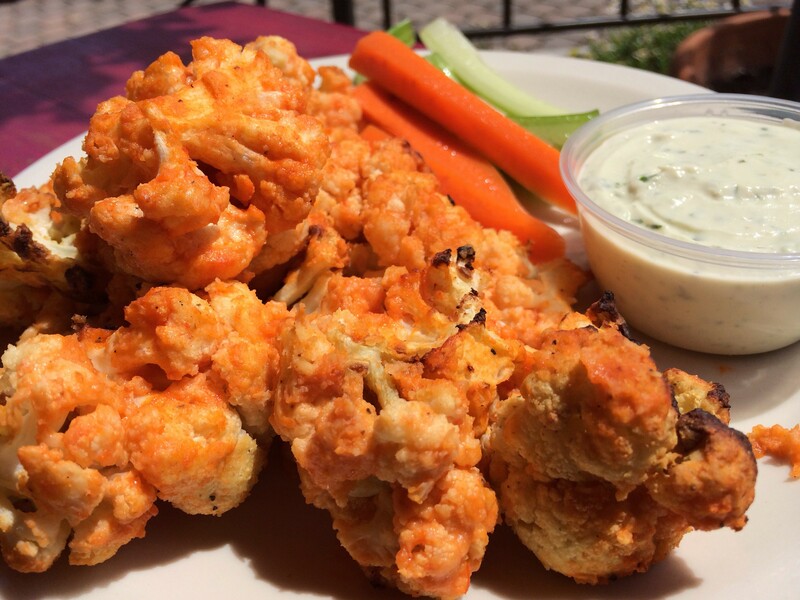 Standing by his response, Mead has taken the notoriously overlooked vegetable and tossed it in a tangy buffalo sauce for Mead’s signature buffalo cauliflower and “blue cheese” appetizer. Cauliflower’s best attribute is how it soaks up flavors, and that’s what happens here. The simplicity of the dish—just the veggie and the sauce—doesn’t undermine the magic that transpires when the dressed cauliflower is roasted and caramelized. Each crisp-tender floret boasts a spicy-bold buttery zing ideal for dipping in a creamy, soy-based vegetarian “blue cheese.” The order is suitable for two but you might find yourself fighting over the charred pieces—just like Nostradomus predicted.